an hour south of Boston. Come and enjoy the night. The concert details are below. New Lullaby CD now on itunes! 14 Amazing Lullabies by 13 composers on one disc. Orlando Cela, who made his whistling debut. are lullabies and who’s afraid of a lullaby?! 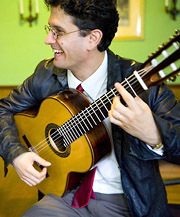 Program: Works from Spain and Latin America by Albéniz and Piazzolla, some Bach, and new lullabies from Aaron’s recent CD release, “New Lullaby” by Mark Small, Francine Trester and Eric Schwartz. Tickets: $10.00. (students $8). A meet the artist reception will follow the concert. Copyright 2009 Aaron Larget-Caplan. All Rights Reserved. In August I met with composer Frank E. Warren to work on his new lullaby, and received a new lullaby from Michael Veloso, as well as a second lullaby from David Patterson. I also submitted scores to Italian publisher Berben for a possible anthology of New Lullabies, which would be edited by yours truly. On August 13th I and performed a couple of solos and was interviewed on Fernando’s Hideaway (BNN) by guest host Leonard Caplan (no relation). The interview and performances can be found on my YouTube Channel: www.youtube.com/watch?v=LAE-heHMPcY&feature=search. Regarding performances, a great thanks goes out to Carolyn Frost for her kind recommendation, for I had the honor of performing a solo recital at North Hill. A great audience! I had to stay for an extra 45 minutes to answer questions about composers and the history of the guitar. A concert of Contemporary Music at the Lily Pad in Cambridge started my August. 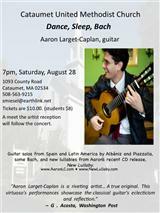 I’ll be performing my final concert of the season on Saturday, August 28 at 7pm at the Cataumet United Methodist Church. Cataumet is on Cape Cod, just 1hr south of Boston. The church is across the street from luthier Steve Connor’s shop, so for guitarists it is a great opportunity to piggyback two wonderful guitar events. Note: I play a Steve Connor guitar.